It starts off simply with aliens from outer space observing a normal human subject from Earth: an 11 year old genius that has recently become a teacher to high school students. What?!? 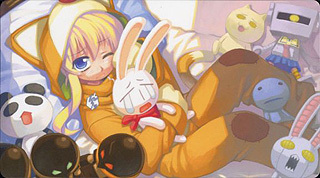 Like any normal 11 year old kid, Rebecca "Becky" Miyamoto has a walking talking depressed but not suicidal stuffed bunny, Mesousa, which wakes her up every day and goes with her to school. What?!? Of course, once she arrives at school, she gets picked on by the students because she is different. Ahhh, yes, finally something that is normal. There is a giant cat that thinks it's a god that warms up the sodas in the vending machine that Mesousa buys from. I knew it! There had to be a reason why sodas come out warm sometimes. 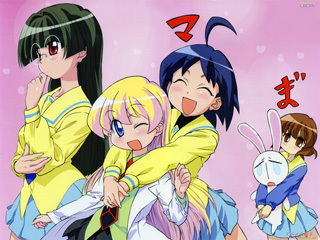 Momotsuki Academy is a normal high school by anime standards. The most normal student in Becky's class is Rei Tachiban: cool, mature, confident, and smart. Unfortunately, she is also prone to violence and fits of greed. Even teachers aren't safe from her sharp tongue; luckily for Becky though, her cuteness, helplessness, and crying fits hiding behind the class windows curtains help bring Rei's nicer side out more often. Next comes Miyako Uehara, a bookworm by nature and by far the one with the largest, shiniest, most reflective forehead ever! You can actually use it like a mirror. I think if they install a solar panel on it, they'll be able to harness enough power for the whole school to use. Ichijo is the class president: strange, scary, totally spaced out little girl. I think she boils up her green tea with marijuana... Kurumi Momose is the plain girl that hides out with Mesousa in the rabbit cage when they both get depressed. Last but not least, my absolutely favorite character since L in Death Note: Himeko Katagiri. Yeah, total opposite end of the spectrum and what? *Rei Tachiban stare* The most happy-go-lucky, energetic, lovable airhead I have ever seen. I think she only has enough brainpower to maintain involuntary bodily functions like breathing. Her train of thought is always in a constant state of derailment and her attention span is worse than Dug in Pixar's Up. "Squirrel" might even work for her since anything cute can divert her attention. Actually, come to think of it, anything would work on her since she is so gung-ho about everything. Her cowlick gives her an inhuman amount of energy and seems to have a life of its own. Think of the Green Lantern and his ring, but cuter. If her cowlick is removed, I shudder as I remember the episode. It was like Wolverine on Ritalin with his claws covered by rubber instead of Adamantium or like Superman wearing a Kryptonite lined suit for fun. 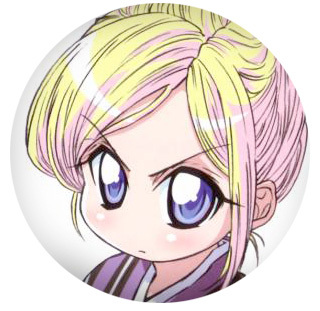 Becky had to bring out her chemistry set to make a new cowlick for her because the chopstick as a makeshift cowlick doesn't work when Himeko gets hungry. Mesousa sure proved his resilience in that one. He was blown up, one artificial cowlick turned into a cowlick fairy, and had his stuffing pulled out from his head like a magic trick. The cherry on top of the sundae called Pani Poni Dash? Subtitles with maximum captioning. What is that, you ask? You know those signs in the background in all the animes that you ever watched that is in Japanese? Yes, now you can find out what they say with maximum captioning. If the craziness in the show doesn't drive you up the wall, the writings on the blackboard and the walls and ceilings will. I watched one episode pausing every 10 seconds just so I can read all the inane mantras, graffiti, homework assignments, rumors, gossips, lies, and other tidbits that pop up. Suffice to say, my finger was cramping by the end of the episode and I gave up watching each episode only once. I wasn't laughing for that one, but my family was. 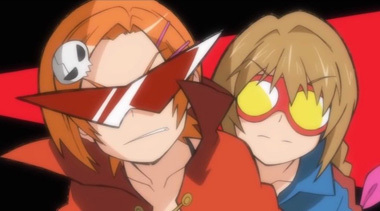 Pani Poni Dash: fun for the whole family, oodles of laughs, and, Oh My God!, did they just make fun of Mr. T? 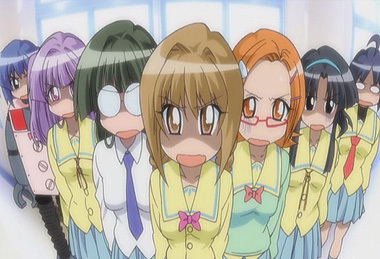 Below: Scenes from the Pani Poni Dash anime series. 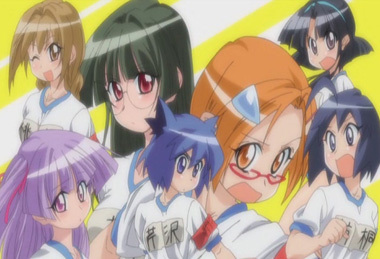 Below: Scenes from the Pani Poni Dash OVA. 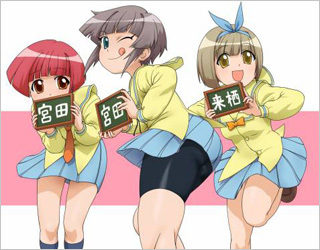 Below: The Japanese opening titles for Pani Poni Dash. 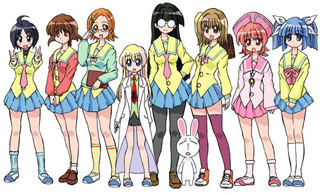 Below: The second set of Japanese opening titles for Pani Poni Dash. 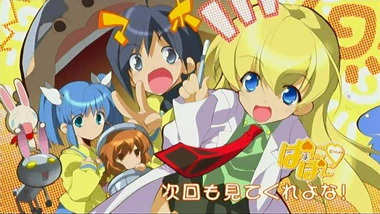 Below: The American trailer for Pani Poni Dash. 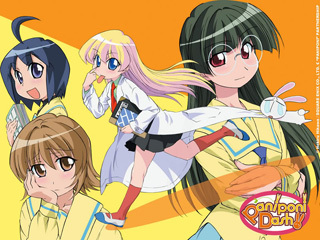 Below: Promotional artwork for Pani Poni Dash.